This review originally ran in the Tuesday, July 3 issue of Shelf Awareness for Readers. If you don't already subscribe, sign up here to receive a bi-weekly dose of readerly goodness in your inbox. In 1911, five-year-old Kitty Easton disappeared from her bed without a trace. Years later, archeologist and amateur detective Laurence Bartram is invited to the family manor to study the unusual Victorian church on the grounds; there, he finds the Easton family unable to escape the shadow of the girl's disappearance, and the Wiltshire country town unable to forget the many deaths of their beloved soldiers. When a kitchen maid goes missing and a woman's body is discovered in the church, Bartram finds himself drawn into the family secrets, the town's gossip and the forgotten places of the Easton Deadall manor. 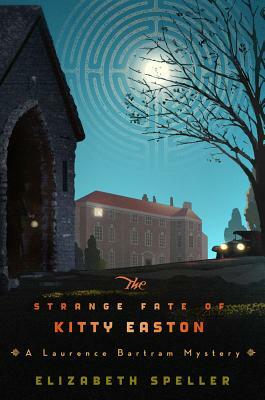 At its surface, Elizabeth Speller's The Strange Fate of Kitty Easton is a mystery novel centered on the disappearance of a little girl, but Speller expertly peels back the story's layers to reveal a rich tapestry of English country life in the years following the First World War, bringing forth themes of loss, blame and politics. Her characters reveal the long-lasting impact of the war on civilian and soldier alike, while bringing to life the era's complex relationships between town and manor, upstairs and downstairs, young and old. Speller's descriptions of the manor house itself, and the decorations of the church, are similarly rife with historical detail. The Strange Case of Kitty Easton proves a delightfully layered, intricate novel of kidnapping, murder and architecture--a brilliant reimagining of the classic manor-house mystery of British literature. This sounds intriguing. I love the sound of all the elements. Thank you for your review. It is definitely a good one - lots of things working together to make the full story. Hope you pick it up and enjoy it! Ooh, I like the sound of this one. I'm just finishing up Thomas H. Cook's The Chatham School Affair and while I'm behind on The Stand readalong, I just put this book on hold at the library. Will be picking it up tomorrow! Thanks for putting it on the radar! I'm really sort of digging not accepting review requests and just reading what I want - breathing a sigh of relief at nor pressures and picking the books I want to read! I hope you like it! I thought it was really well done. And bravo! for not accepting review requests/reading whatever you want. My goal was to do that this summer, and I've done a MOSTLY good job of it... but I still feel the weight of too much obligatory reading.